Scale Model Soup: Why the large stash? This month’s topic from the shop steward at The SprueCutter’s Union is why we have large stashes of unbuilt kits. Here’s the thing. I don’t think anyone enters the hobby with the intention of having a large collection of unbuilt kits. I’ve never met anyone who, at the time, owned 25 kits and told me, “I plan to have 500 kits some day.” No, it just happens. I had the beginnings of a stash when I was 16 years old, when my unbuilt kits could no longer be stored in a suitcase under the bed. There was that momentous day when my latest acquisition wouldn’t fit inside with the others, and that was when I started having a “stash,” and it’s been growing ever since. We all know the appeal of a new release of a favorite plane, tank, ship, or car, particularly one you’ve been waiting for for years. When Trumpeter released their first T-64, I had it within weeks. Have I built it yet? No. In our excitement we forget, as Jon at The Combat Workshop suggested, that we’ll be able to buy that kit anytime in the future. Few models are “rare” these days. I’m a sucker for a good sale. 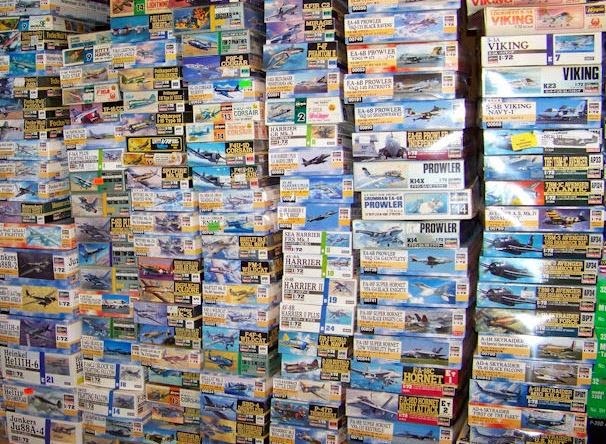 I always find Squadron’s Black Friday sale irresistible, and Rare-Plane Detective’s half-off sale on the final day of the IPMS Nats always entices me to buy a model or two. And then there’s the bargain, that $25 kit you find for just $5. You probably would not have bought the model at retail, but the deep discount leaves you powerless. I wrote about this a couple of years ago, buying a Hasegawa 1/72 F-16 for $5 despite the fact that I already had six in the stash. I've purchased every model with good intentions, and I can point to each one and tell you how I intend to build it and which markings I plan to apply to it. I want to build every model in my stash…even though my basic math skills tell me there’s no way I’ll ever build them all, at least not at my current rate. I’ll talk about where that leaves me in a future post. I have a couple of different reasons for having such a large stash. 3) There are parts in some kits that are only in that one kit (or maybe in two different kits), throughout the history of all kits in 1/72,,,,,,so, I have 1/72 Old Tool Hasegawa F-4Es for the travel pods, the Academy F-8 for the Dual Zuni launchers, the old Skyraiders for the little gun pods,,,,,another long etc goes here. And then there is the sad part,,,,,,,as you can see, I have a set collection to a set theme,,,,,,but, I like F-4s so much that I have a bunch of aircraft other than the USN and USMC versions, and I like some of the markings so much that even though I have one set of markings for a squadron, there are others included for that same unit in some of my kits or decal sheet sets, that I just "had" to get more Phantoms to use them on. Then there are the other two "off topic" subjects that I like,,,,,,Trainer aircraft and ground support equipment. So, only a couple of years of cutting my stash down to "one large subject",,,,,,,I am back to having four "collections" again,,,,,,,but, I gotta ask, how do you resist something like the new tool Airfix Tiger Moth? Or any kit that is of that sort of quality? We are supposedly here to build models, and no matter what we collect for the stash, there are certain models that just go together well, and those satisfy the builder in us too well to pass them up because they are "off topic" for us,,,,,,,,,,after all, we set the topics ourselves, so we can change those anytime we want. Besides, I "only" have 600 models, of which I only intend to build about half. When I see a particularly good new release or a particularly well made model at a contest, I often find myself in that "how do I resist" mode. At least 20-25 models in my stash account for those impulse purchases. Great observations! 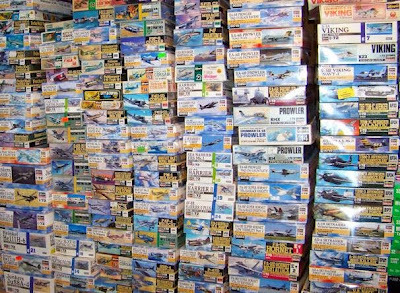 Oh and that "you can always buy it later" isn't really true,,,,if you just want to go and buy any ole kit, you can always buy one,,,,,,,,but try finding something specific like "the Hasegawa 1/72 Blue Box F-4G kit with that decal sheet",,,,and you can't do that,,,,,they were truly gone until Hasegawa did one re-release recently,,,,,and they changed the decal sheet,,,so that # Ka-8 really is "unique and sold out everywhere"
There was a thread on Hyperscale about a month ago dealing with large stashes, and I'll repeat what I wrote there. Having a large stash isn't something to shoot for, but if (1) you have room, (2) it doesn't cause any tension between you and anyone living with you, and (3) it doesn't cause financial hardship, I just don't see the issue with having a lot of kits - even if you know you will never build them all.